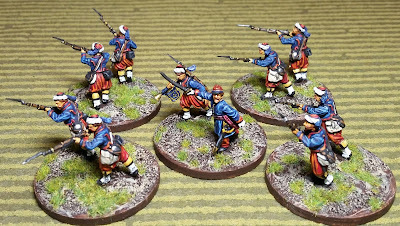 Just a quick mid-week post; I normally don't pick up a paintbrush until the weekend, but since I got home early I managed to finish up these cavalry casualty figures this evening. Still need to base them on poker chips. These are all conversions from Perry plastic spares. 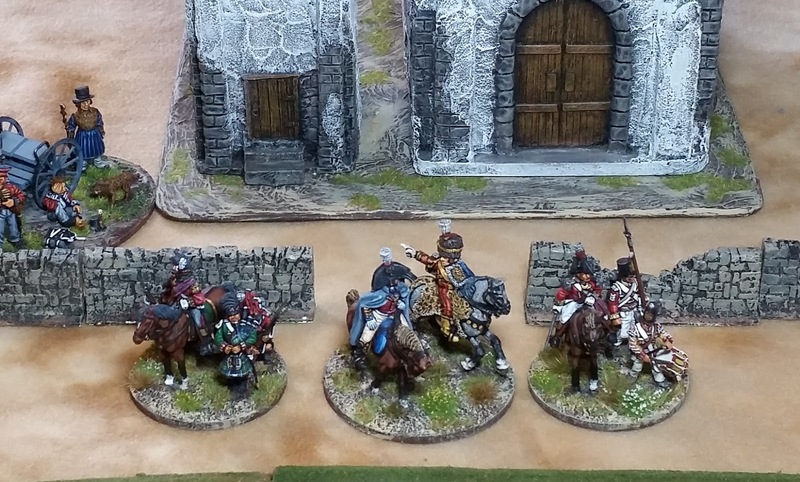 Top row, l-r: British Light Dragoon; French 9th Hussars; Spanish Dragoon. 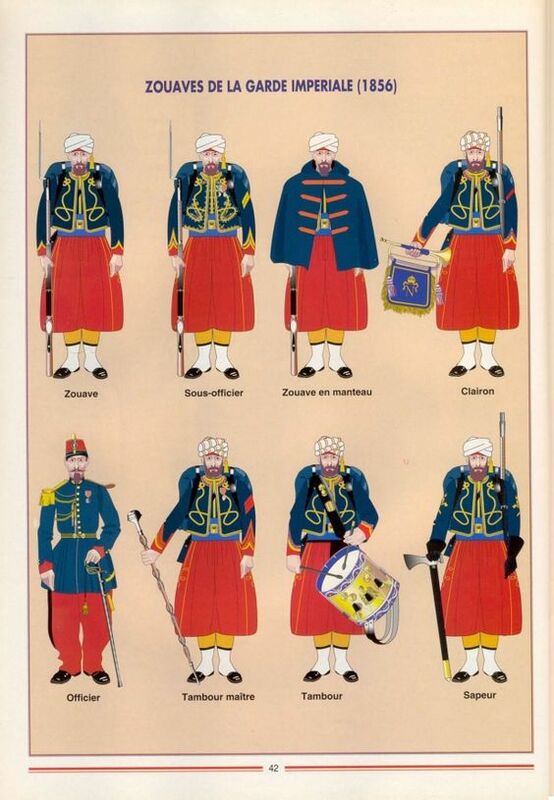 Bottom row, l-r: French Chasseur a cheval; French Carabinier; French Chasseur a cheval; British/KGL Hussar. Looking forward to using these for the cavalry-heavy scenario in the new book - "The Eve of Waterloo." 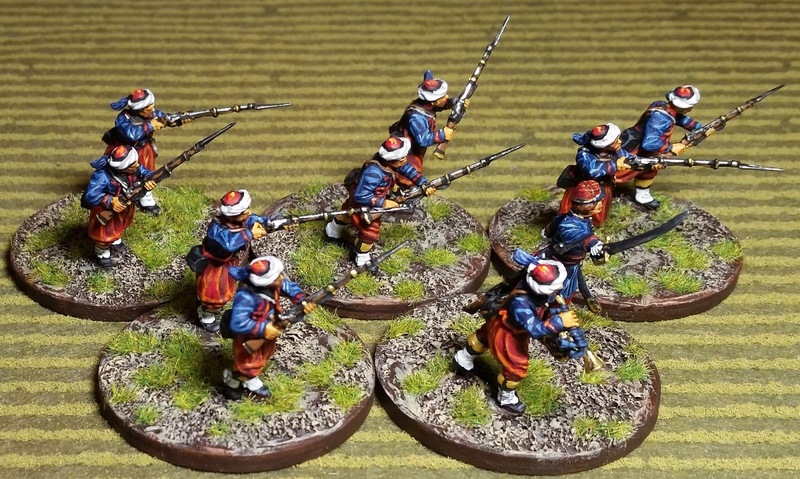 I hope to add a couple more cav units for this game - maybe some Warlord British Household Cav and French Lancers. Although cost-wise, Perry's aren't much more (and you are sure of the quality), I do like plastics over metals. Still undecided though. 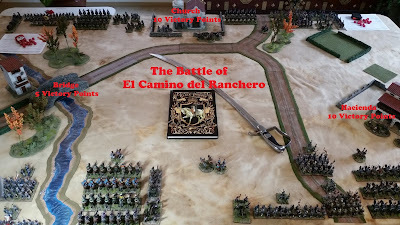 Just finished cleaning up and putting away the figures and terrain from a successful first game using the Black Powder 2nd Edition rules. Actually most of the rules are pretty much the same as the original. One exception was the use of the Army General to re-roll failed commands by the brigade commanders. The four players of today's game are longtime gaming buddies, Jim, Gene, Kevin and David. David being a veteran Black Powder player was very helpful in keeping the game flowing. Here's David's "I Live with Cats" blog, and also Kevin's "A Gamer's Tale" blog. The scenario was the same one used at last month's Fix Bayonets game day. Although Victory Points were used, the game turned into a basic slug fest with the French and British trading a lot of shooting and combat. After about 8 or 9 turns, the game was declared a close victory for the British who ended up capturing the bridge in the last round. This was after David had to leave and I took over his French brigade. Sorry David! Here's the layout prior to the game. The Army Generals with ADC - although we didn't use the ADC option during the game. 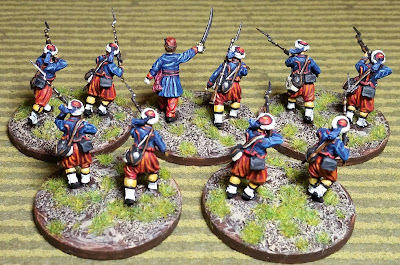 The British and French brigades - two per side. Having only four players, I reconfigured the formed infantry into 24-man units (except for a 32-man Coldstream Guards "large" unit), but kept the cavalry in 8-figure units. I didn't want the cavalry to have too large a foot print on the 5x8' table. It seemed to work out pretty well. I should mention that we used 2/3rd's reduced movement and shooting ranges; however, we kept the 12" basic command/order distances. 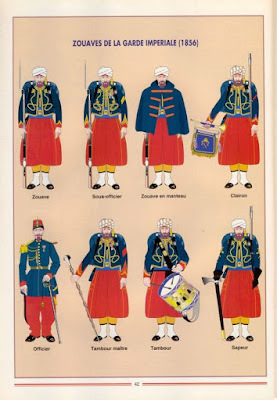 British Brigade consisting of: 1 large unit of Coldstream Guards; 1 unit of line infantry; 1 small unit of 5/60th Rifles; 1 small unit of Spanish Guerrillas; 2 light cavalry units (1st KGL Hussars and Spanish Dragoons); 1 unit of heavy cavalry (Spanish Cuirassiers); 1 RHA battery and 1 RA battery. 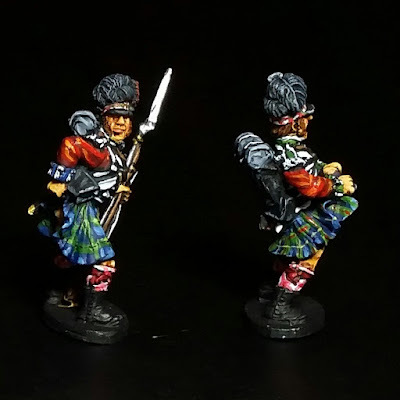 British Brigade: 2 units of Highlanders (42nd Blackwatch and 79th Cameron); 1 unit of line infantry; 1 small unit of 95th Rifles; two units of light cavalry (1st KGL Hussars and Light Dragoons); 1 battery of RHA and 2 batteries of RA. French Brigade: 2 units of Young/Middle Guard Infantry; 1 unit of line infantry - all with Voltigeurs for Mixed Order formations; 1 unit of light cavalry (9th Hussars); 2 units of heavy cavalry (Cuirassiers and Carabiniers); 1 horse artillery battery; 2 batteries of foot artillery. 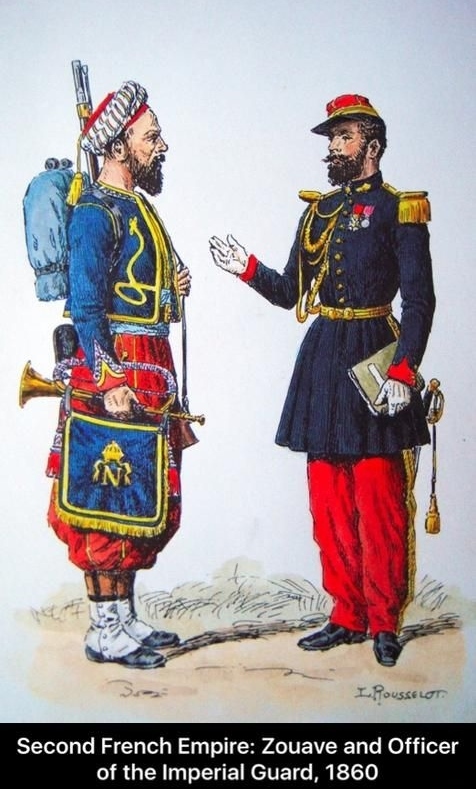 French Brigade: 2 units of light infantry; 1 unit of line infantry - all with Voltigeurs for mixed formation options; 3 units of light cavalry (9th Hussars and 2 units of Chasseurs a Cheval); 1 unit of medium cavalry (Dragoons); 1 horse artillery battery; 1 line artillery battery. Here are pictures from the game. Once again I was a bit preoccupied hosting and neglected to get more pictures. I'm glad I remembered to take the ones that I did. Around turn 2? And yes, chili was served - it later got a bit noisy near Jim's end. Pun intended. The view from the French right/British left. 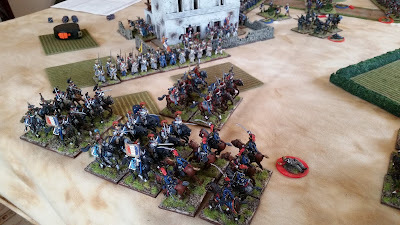 Those are the light cav units run by Kevin about to take on Gene's French heavy cav. Kevin's Rifles along the hedges in the vineyard having already shot up a French line unit which had to retire back to the side of the hacienda. Gene and Kevin both used their artillery batteries to good effect. Kevin's 42nd Highlanders trying to shoot up Gene's artillery batteries. 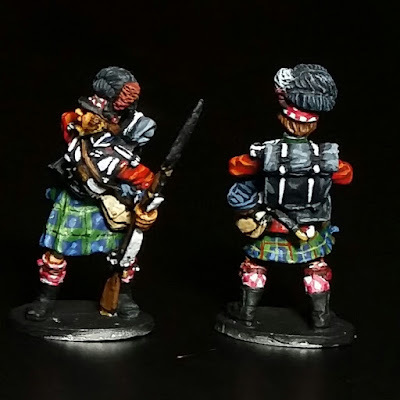 The Highlanders ended up breaking after taking too many casualties and failing their Break Test. Note one of the French batteries having been disordered from British fire - I think from an opposing British battery out of the picture. There were a lot of 6's during Shooting - causing a heck of lot of disorder! 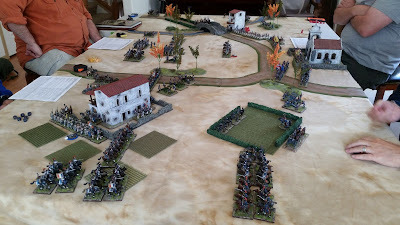 Another view of the French right; Gene got a unit of infantry into the hacienda early in the game. The French unit which had retired along the hacienda having removed a casualty after a successful Rally by their brigade commander. The French left/British right. 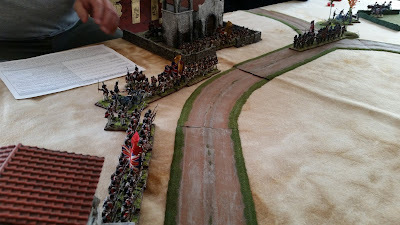 Jim's British light cav in action against David's Chasseurs a cheval. 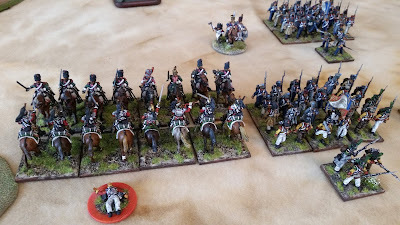 Poor David had successive bad command rolls - only lately bringing on his cavalry units. 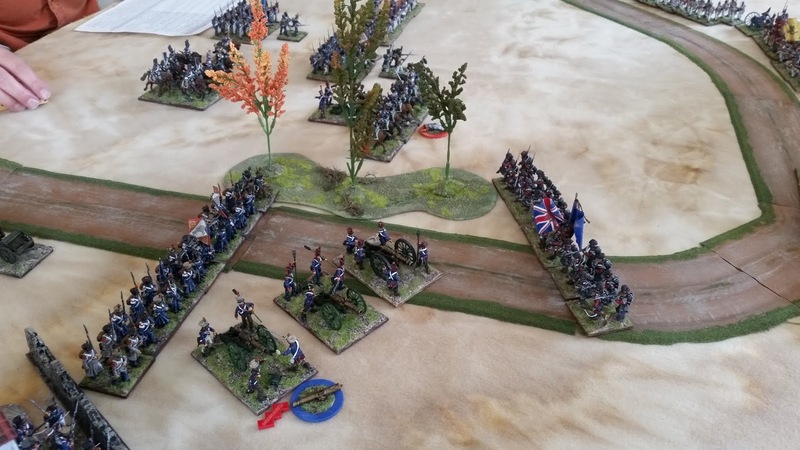 Jim's Coldstream Guards and other units in line ready to shoot up any French advance on the British right. British 1st KGL Hussars vs. French Chasseurs a Cheval. As you can see the KGL guys are already Shaken. An actual casualty figure is used for the first casualty and subsequent ones use skulls. The idea is the figure casualty is the one which must remain if Rallying is used. 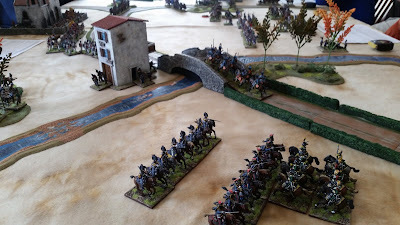 Jim's Spanish Cuirassiers in combat against David's Dragoons. 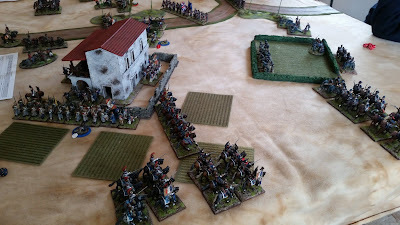 A unit of Neuchatel are in Attack Column to the right. 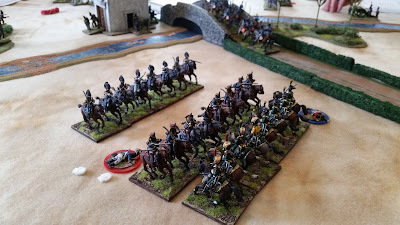 Again, more cavalry combat between Kevin's British 1st KGL Hussars and Gene's French Heavy Cav. I must say I thoroughly enjoy playing/hosting Black Powder, but feel these rules are probably not the best for a convention game with the possibility of players with little or no experience. 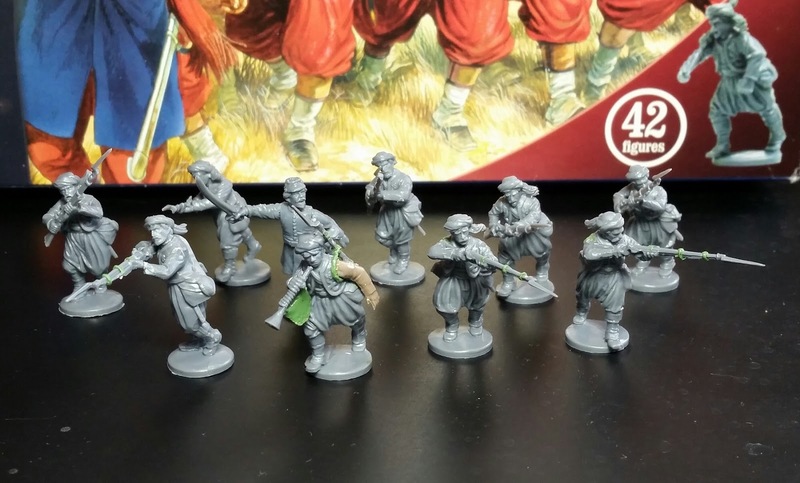 Although the rules are simple enough, there are a lot of little things which would bog down a convention game where players want something easily understood and fast-playing - which as a GM I would also want. 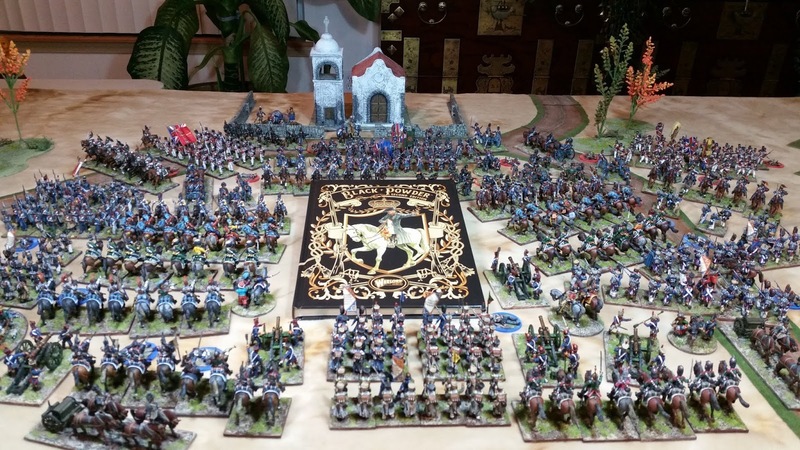 It is however, a great game for militarily inclined gentlemen with straight backs, bristling beards and rheumy eyes that have seen a thing or two! 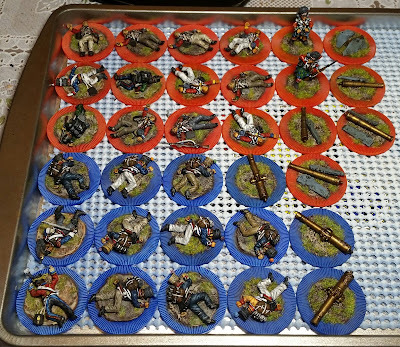 Added a few more casualty markers, including the use of spare cannon bits from the Victrix sets. Cheap plastic Bicycle brand poker chips in blue and red are used as bases for quick recognition. 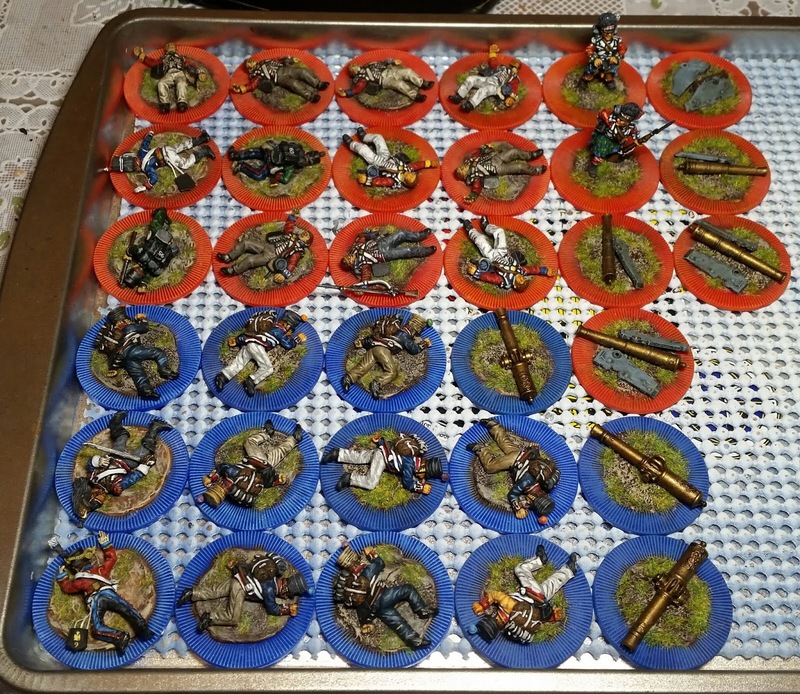 These markers will be used for the first, initial casualty, and small Litko skulls will be used for subsequent casualties. Here are all of the markers so far. 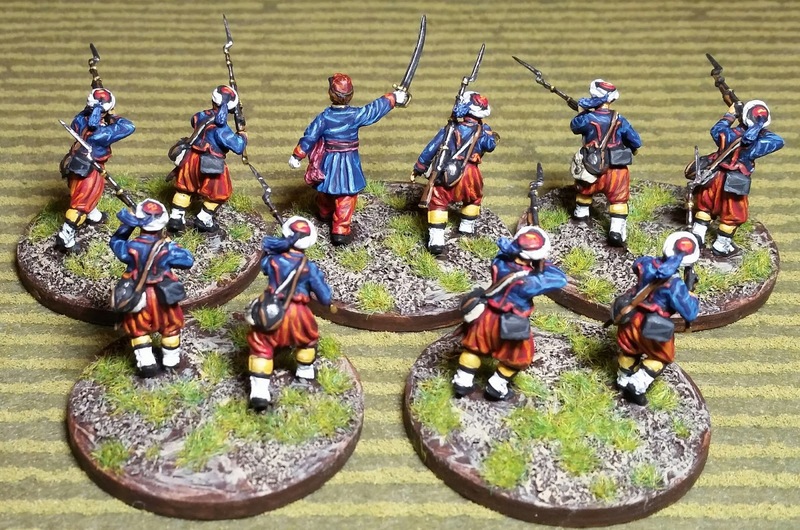 I had actually sold the previously made markers to my buddy Ted (Stern Rake Studio blog) last year, but since getting back into Black Powder, he was kind enough to allow me to buy them back! 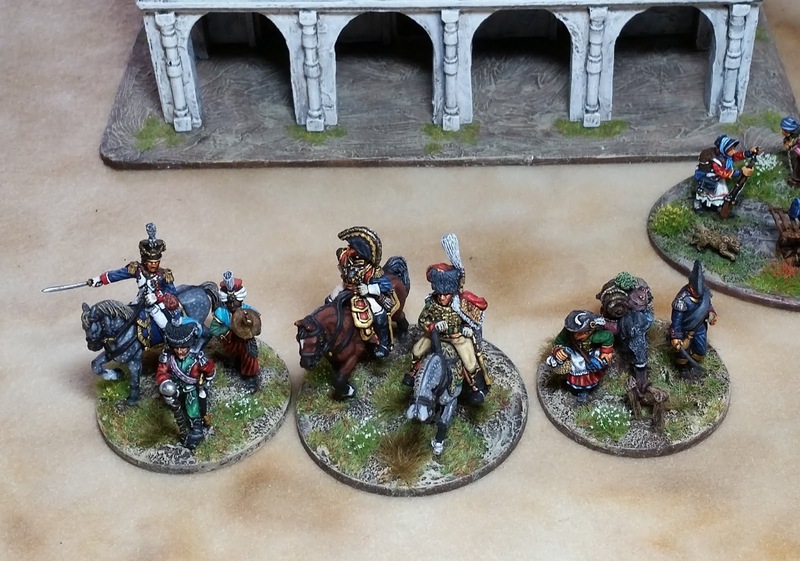 I still need to add a few more markers for the cavalry units. The Perry sets have double the number of riders for different style legs and bodies. They'll need a little bit of conversion work, but nothing a sharp blade and hot knife can't take care of. I've done this already on a couple of Hussars (one each French and British) and a Cuirassier. They're in the far left row in the image above. 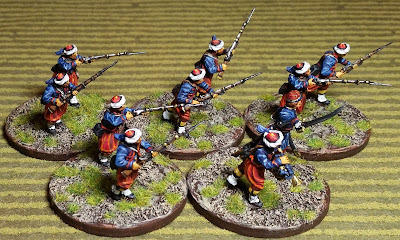 Looking forward to the game this coming Saturday with a some buddies who haven't played Black Powder much - in fact, I think it might be the first time for a couple of them. I'm honored to host the game, and hope they get a kick out of it. Best wishes to you all! 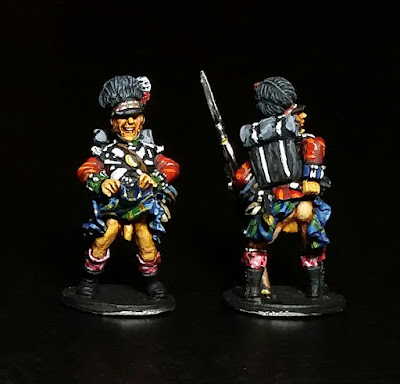 A couple more Black Hussar minis - this time a bit more comical in nature. 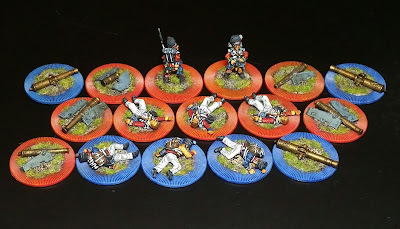 I plan to use them as casualty markers. 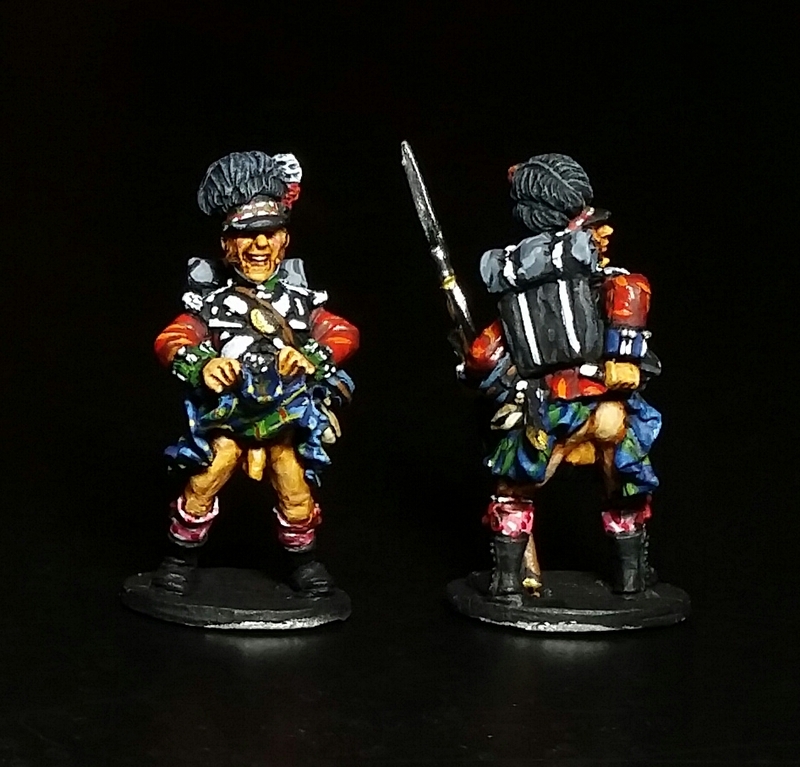 The cheeky guy is with the 79th Cameron and the grinning one with the 42nd Black Watch. And some of the green in the center of the dicing on the bonnet. 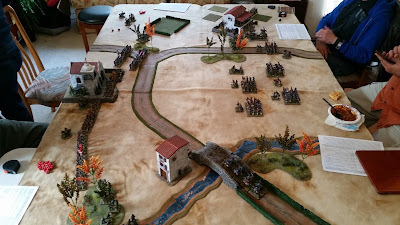 On the gaming front, I'm hosting a Black Powder game next Saturday. Thanks for stopping by, and best wishes to you all. 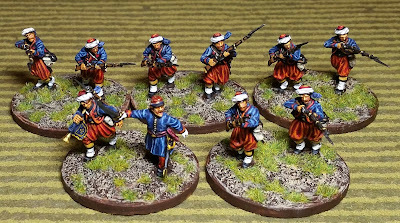 Couldn't pass up an inexpensive box of Perry ACW Zouaves on ebay as I've always fancied painting some up. 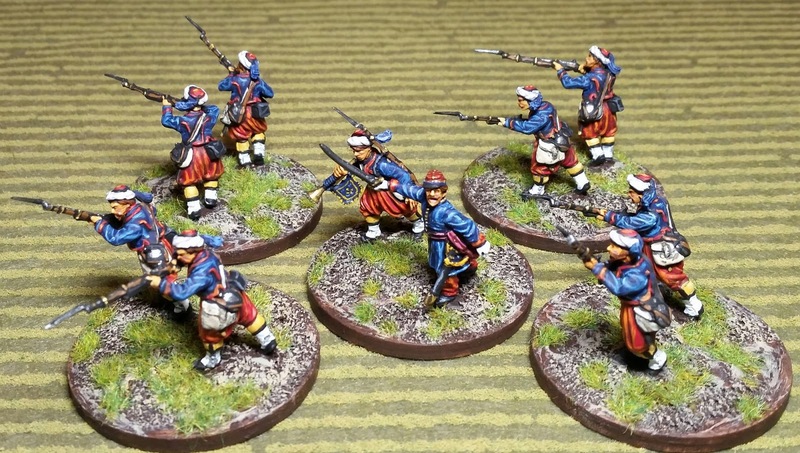 Admittedly, I've never had an interest in ACW, but figure they could be painted as French 2nd Empire troops as well. 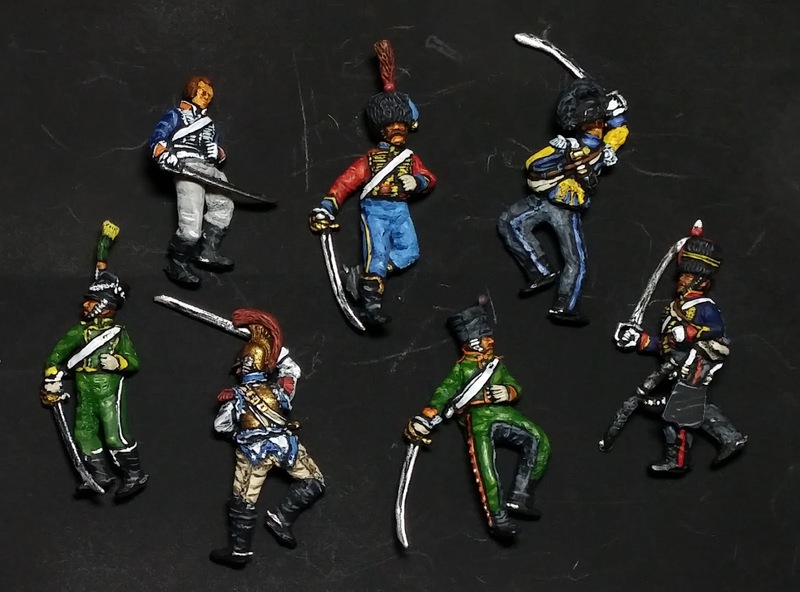 Wanting some firing poses, I used some spare Perry British Napoleonic arms. Some Green Stuff was used to replicate the rings around the barrels. Also used Green Stuff for the little banner under the bugle - the arm being a spare from the French Chasseurs a Cheval set. 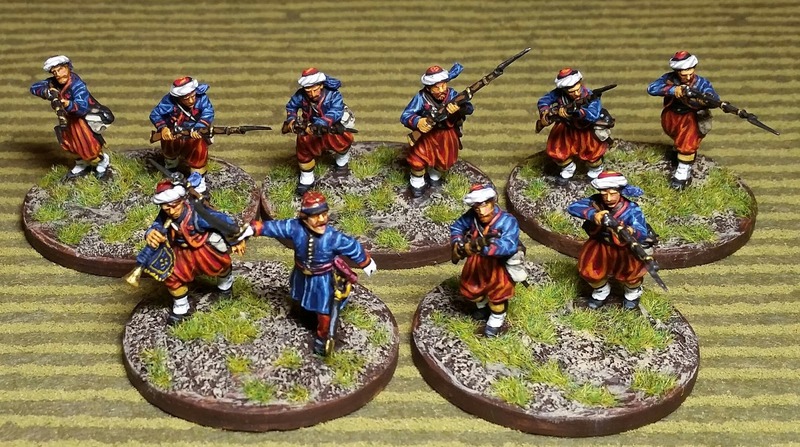 Some images from the internet for painting guides. I think the uniform is pretty much the same up through the Franco Prussian War. Some sources show the turban not being worn. 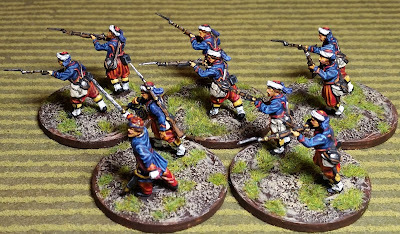 If I ever get around to acquiring Prussians to oppose the French, I may try them out using Bolt Action. 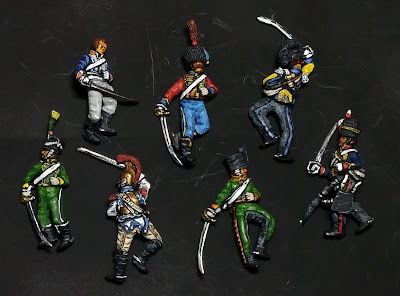 I don't intend to collect a lot of figures for this, but do like the look of the troops - French in red pants and Prussian in spiked helmets! Thanks for dropping by and best wishes to you all. 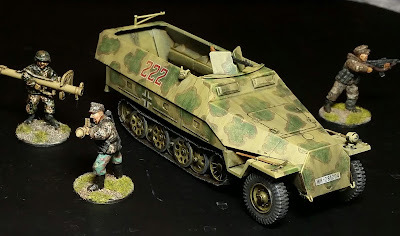 Here's a Tamiya 1/48 scale plastic kit I picked up off ebay from a seller in Japan earlier this year at a great price - about half of what they go for in the US. As with all the Tamiya 1/48 scale kits I've worked on so far, it went together quickly and easily. After spraying it with a coat of Tamiya Dark Yellow (aka Dunkelgelb), it sat unfinished for several months as I wasn't sure what kind of camo work to finish it with. 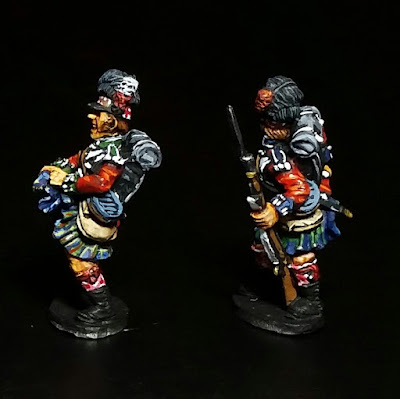 I don't have an airbrush, nor do I plan to ever get one - the maintenance puts me off. So I needed to find a pattern that could be applied by brush and still have a fairly decent result. I found a pattern on the internet the other day which looked do-able and gave it a try. Here it is with Victory Force Miniatures for scale. There were two long stemmed rearview mirrors on each front fender, but ended up breaking them off while painting. Figured they get broken during gaming anyway. The irregular, splotchy green pattern with a dark brown border looked cool in the image I found. However, looking at how it turned out reminds me of an Aloha shirt floral print. I tried to disguise the "flowers" a bit with dry brushing and washes. 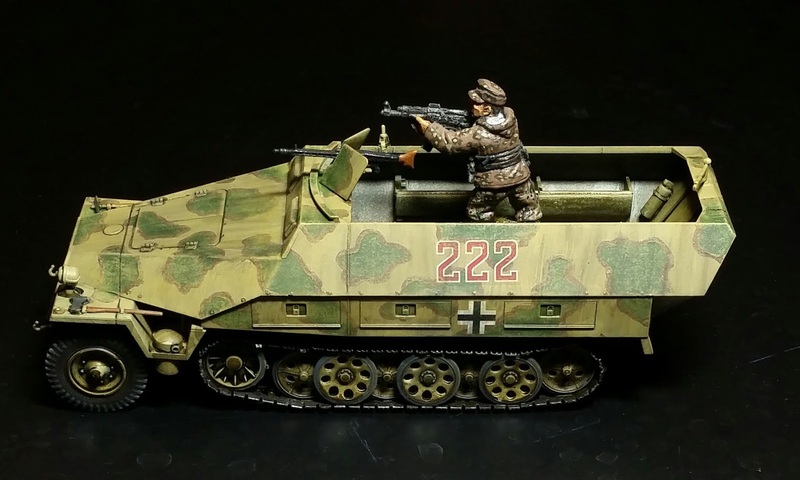 The "WH" on the rear panel id's it as a Heer vehicle, yet they're Waffen SS guys in and around it; leave it to the SS to commandeer the vehicle. If I ever get another one of these, I'll try out a different camo pattern. All in all a very good kit and sturdy enough for gaming (after the fiddly mirrors were removed). 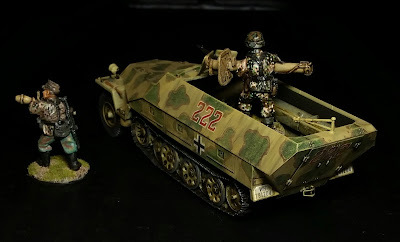 I know there are nice 28mm kits, but all of my other vehicles are either 1/48 or 1/50 (Corgi) models. It was another nice change up from Napoleonic units and makes me think of getting a few more model kits. Well, thanks again for visiting and best wishes to you all.